Learn how to design an infographic with HTML, CSS and jQuery, by following this easy, step by step tutorial. Check it out and start learning! 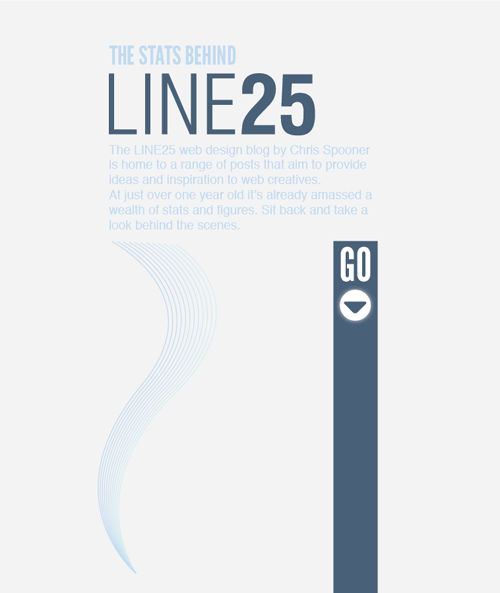 I’ve been wanting to get stuck into a creative infographic for quite some time, so recently I started work on a personal project that involved the design and build of a graphic to portray the stats and figures of Line25. To mix things up a little and to take it a step further, I decided to have a shot at building the whole infographic as a complete web page. Here’s a walkthrough of the project, showing how resources like Cufon and jQuery’s ScrollTo plugin were used to add some flair and interactivity to the design. 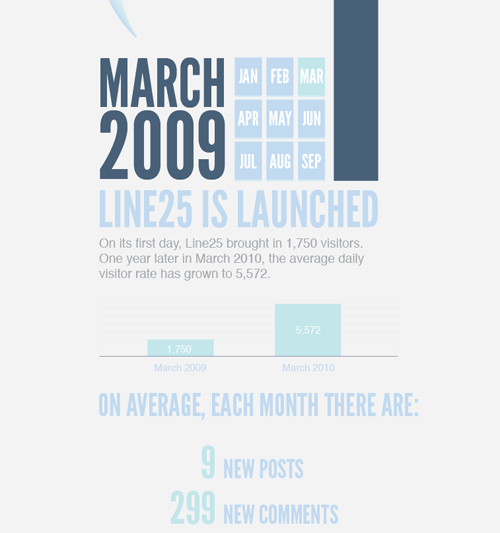 The design itself was put together in Adobe Illustrator using a bunch of Line25 stats. A limited colour palette was used to stay true to traditional infographic designs like airplane safety cards, with a couple of blues, greens and greys making up the scheme for the design. Large typography was one of the main ingredients, with League Gothic being the perfect fit with its tall and bold appearance. Charts, diagrams and icons also make up large portions of the design, all aiming to add interest to the otherwise boring facts and figures. With the idea of building a web page out of the design in mind, I bundled in some large margins and gaps between the sections, the idea being that the jQuery ScrollTo plugin could make for some cool interactive scrolling. Swirly lines and gradients in these areas would add some visual flair as the browser window zooms past. 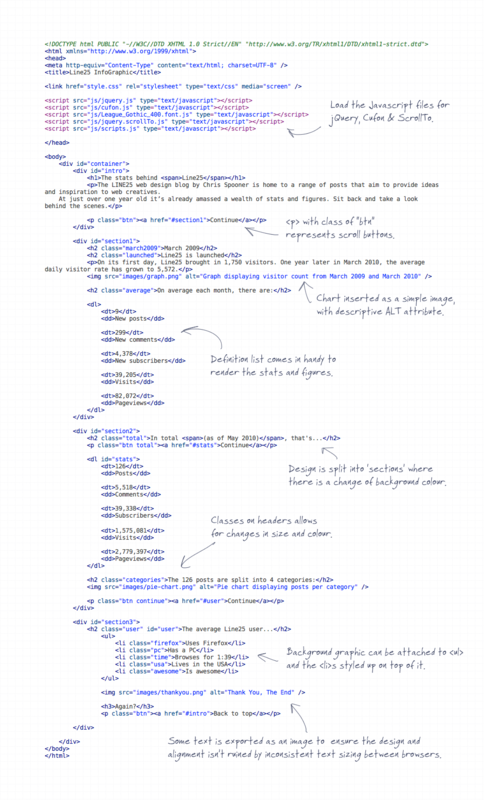 Once the overall design concept was complete, the basic information was laid out in plain old HTML. Paragraphs of text and headings were used where possible to allow the majority of the design to be rendered by the browser, then it was all styled up with CSS one section at a time. 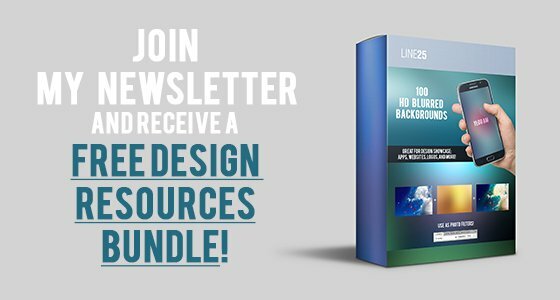 <p>The LINE25 web design blog by Chris Spooner is home to a range of posts that aim to provide ideas and inspiration to web creatives. The intro section consists of a short header, the Line25 logo, intro paragraph and the first button element. The background of the design was added as a background image to the intro <div>, and plenty of padding added to replicate the large portions of white space. The heading is configured in size and colour, with the <span> coming in handy for some image replacement as the Line25 logo. After a short scroll section one begins with a simple graphic, followed by paragraph text which introduces the first chart. The large lists of facts and figures fits perfectly as a definition list, with the two pieces of related information being marked up as either <dt> or <dd>. Section two switches from a grey background to a dark blue, and starts with a short title and swirly pattern graphic before heading down to the meaty information lower down. This graphic is added as a background image to the section2 <div> and lots of padding added to bump down the content. Classes on each title allows the sizing to be altered to adhere to the original design. Section three begins after another short scroll which transitions from the dark blue background to mint green. This section presents information overlaid over a graphic, which is set as the background of a <ul> and the information itself marked up as <li> elements. Classes on each <li> make it easy to attach icon graphics alongside each title, and margins align up each list item between the dotted area of the background image. Rather than write commands for every button, I targeted the ‘btn’ anchor, then used .attr("href") to grab the target from that particular anchor. return false; then stops the original HTML anchor link from working. So here it is, the final result of my little experiment! wow. Very cool. Really appreciated the breakdown and effort. Nice color pallette and design too.. Felt that it could have been scaled down a couple of notches..
awesome though.. keep em comin. I am so happy to see the work on HTML. It is my first experience. best article I&apos;ve seen on line25. applause. and thanks for sharing. Thanks for the kind comments everyone, it was good fun to put together so I&apos;m glad to see people showing an interest in it. Hey Chris, just commenting again to let you know that i&apos;m going to be using something based on this during our coverage of T&T 2010 Election. Thanks for this tutorial again bro! Chris Spooner, you&apos;ve done it again!! Thanks for the great TUT your awesome! I have just upgraded to CSS8. But Password manager stopped up working. I was able to do the info backup to save the passwords, and used the upgrade installer to get it loaded. Anyone here can guide me what is the problem? Absolutely amazing! So well explained. Thanks a million! This is awesome!! Great article and great work. 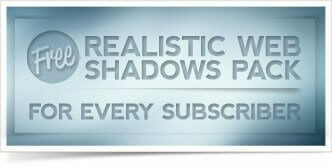 A good follow up to this article would be in HTML5 and CSS. One question always springs to mind though…where the h*ll do you find the time to makes these things ??? Thank you for sharing how you built this, Chris. Not only is it lovely to look at, but the explanation of your process is very insightful as well. Fantastic stuff. Will definately give Cufon a go as an alternative to Font Face. Looking forward to the next piece! chris, this is really awesome……..
Nice job, it is easy to read and to navigate. I really like this, great job. I guess the next step is to load the data dynamically? Have no idea how, but that would be cool. Sweet infographic Chris! Really great way to display fairly dry info! Bravo! Very impressive and easy to follow the content. Thanks for this article. Interesting stuff! Great job man! Excellent stuff. I&apos;ve been looking for a start point on creating some beautiful and living infographics, you&apos;ve really helped point me in the right direction. Great stuff Chris, keep the experiments coming! I love the end result, it looks fantastic. League Gothics really rocks. Good one Chris. Great way for people to display their info for advertising stats or freelance/online resume also. Really nice clean design and really like the use of the large typography. ScrollTo is one of my favourite plugins it just makes the whole experience fluid. That was a fun ride Chris! You&apos;re so good with Illustrator! I love the design. 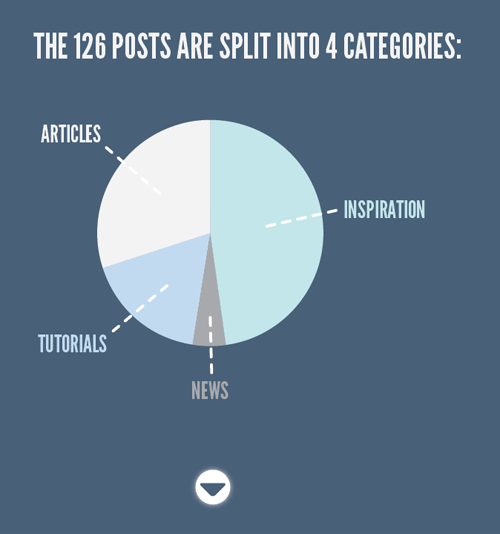 Thanks for sharing, the tutorial might come in handy for uniquely styled blog posts. I like the design, but it&apos;s more of an illustrator design job than css, really. Why Cufon? Why not CSS @font-face? I assume it is because of copyright issues or something. When using @font-face you need to upload the font too, thus making the font available for download for everyone. I played with Font-Face in the last article, so Cufon was the new flavour of the week. Could have easily been created with either method. This is Awesome Chris. 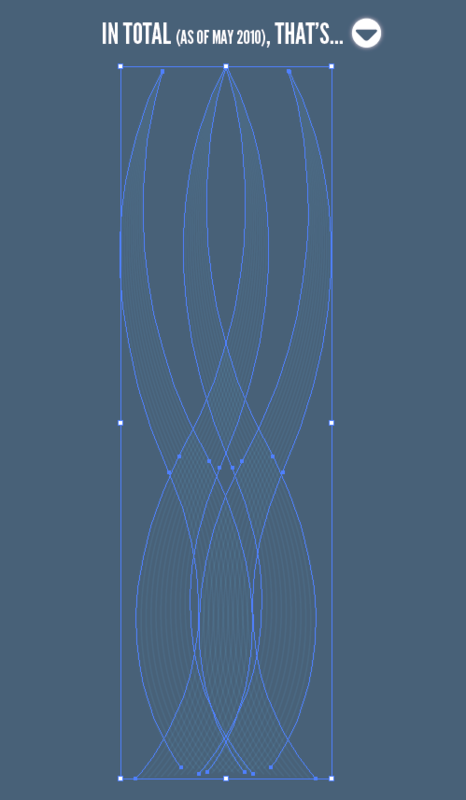 Can you do this in Photoshop too and code it in Dreamweaver? Chris, each time you experiment and share your work, I learn new stuff, thanks for that! This is absolutely awesome Chris!! Love it! This would have been perfect as a HTML5 project mate, seeing as your div&apos;s are labelled &apos;section1&apos;, &apos;section2&apos; etc and most of your users are on Firefox it would have been supported fine (and non-html5 supporting browsers would have coped if you used the html5shiv script). Still looks brilliant though mate, well done. Absolutely, I should create a HTML5 clip in Coda. I quickly dumped in my usual XHTML Strict Doctype for this project without second thoughts! Nice big typography. Like the simple graphic and scroll down efect. Thanks Michael, experimenting is always fun, sharing the results is even better! Hi Chris, thanks for the tutorial.. it Rocks!!! I&apos;ll use whenever I have a necessity like this one….. Thank you Chris for this detailed jQuery-tutorial, It&apos;s great! 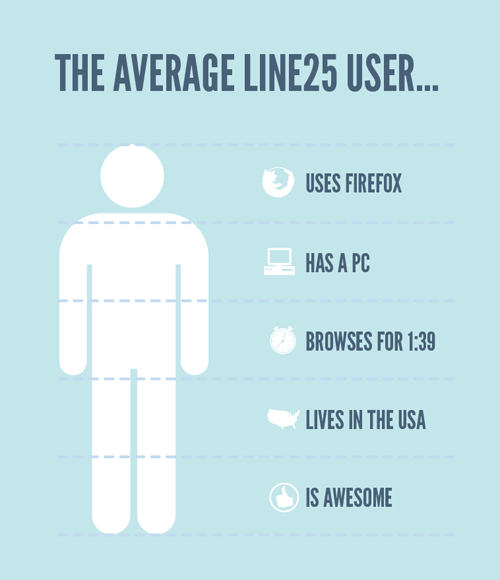 The average Line25 user: browses for 1:39 .. what? Thanks for sharing this wonderful information Chris. The work is pretty and awesome! This is a really amazing concept. I love the infographic and I really enjoyed that you converted it into an actual, scrollable web page, create way to present information. Very cool Chris – the real deal over here is the design; converting it to HTML/CSS/jQuery wasn&apos;t the hard part. Oh, and thanks for calling me (or "us") awesome ;) .